Say you have a view controller with a table view, and you want to load 100 rows of data into it, these data are retrieved from a web API, how would you approach this? This post assume that you already knew what is URLSession, JSON parsing, delegate and tableview. The simplest approach would be loading all 100 data using URLSession at once in viewDidLoad, then update the table view data source and reload table view after the response is retrieved. A more advanced approach would be loading data by batches, like loading the initial 20 rows, then load another 20 when user has reached the bottom, this is similar to how Facebook / Twitter load their timelines. @IBOutlet weak var coinTableView: UITableView! UITableViewDataSourcePrefetching protocol for UITableView and UICollectionView is available since iOS 10. The delegate function tableView(_ tableView: UITableView, prefetchRowsAt indexPaths: [IndexPath]) will be called when a row is near the display area, you can call the web API and load them inside this delegate function. Similar to tableView.dataSource from UITableViewDataSource, there's another property for table view to store the Prefetch Data Source, prefetchDataSource. Here are just my observations as Apple didn't mention exactly how many rows outside of visible area will be prefetched. 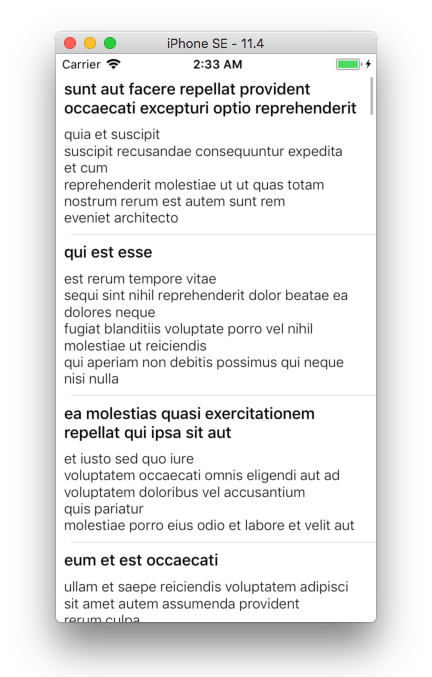 tableView(_ tableView: UITableView, prefetchRowsAt indexPaths: [IndexPath]) doesn’t get called for rows which are visible on screen initially without scrolling. 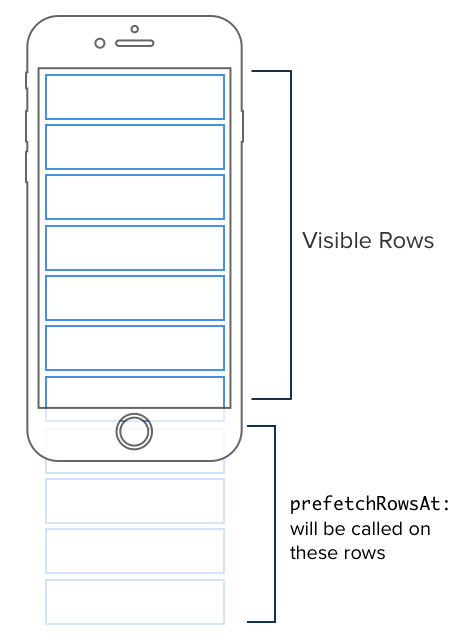 Right after initial visible rows became visible, tableView(_ tableView: UITableView, prefetchRowsAt indexPaths: [IndexPath]) will be called, and the indexPaths variable contain around 10 rows nearest to the visible area. Depending on the scrolling speed, the indexPaths in prefetch method will contain different amount of rows. On normal scrolling speed, usually it will contain 1 row. If you scroll at a fast speed, it will contain multiple rows. Below is a demo video of calling the prefetchRowsAt and cancelPrefetchingForRowsAt method from UITableViewDataSourcePrefetching. In the view controller, we will use an array to store News object retrieved from the API, this will be the datasource for the tableview. We also have another array to keep track of the URLSessionDataTask used to call the API. In viewDidLoad() , we set up the table view's data source and prefetch data source to the view controller itself. Here is the function to fetch the news data from the API. We will fetch the data by creating a URLSessionDataTask, and after this data task is started, we will append it to the dataTasks array we defined earlier. let url = URL(string: "https://hacker-news.firebaseio.com/v0/item/\(newsID).json")! As a refresh from ELI 5: Optional, "self.newsTableView .indexPathsForVisibleRows? .contains(indexPath)" contains optional chaining, as .indexPathsForVisibleRows? might return nil when there are no visible rows (no row at all) in the table view, if it return nil, the whole statement became nil. The ?? false at the back is nil coalescing, it means that if "indexPathsForVisibleRows? .contains(indexPath)" returns nil, the value after the double quotation mark will be used, which is false. After the particular news data is loaded, if the row that is supposed to show the news data is in the visible rows area (it is currently blank now), we will update / reload that row with the loaded news data. To optimize network calls, we are going to add a cancelFetchNews function which will cancel the dataTask used to fetch a specific news when user scroll away from the row that is supposed to show that news. This function will be used in the cancelPrefetchingForRowsAt delegate method. Now we can plug the fetchNews function into the cellForRowAtIndexPath method, if the cell on screen didnt have its corresponding news data loaded, we will fetch the news data from API. configureCell is a custom method I wrote to assign the News data to different labels on the cell. truncateCell just set the labels text to blank. Here is the secret sauce of this post, we will call the fetchNews function to retrieve the news data for the rows that are near to visible rows area , but still not visible yet. So that user can have the illusion that there is no loading delay 👀 (data is already loaded before the row is visible on screen, shhhh). We will also call cancelFetchNews in the delegate method cancelPrefetchingForRowsAt when user scroll away from the loading row. This way, we can optimize the network call by cancelling it since we dont need it at the moment. The prefetch method provided by Apple allows us to lazy load data, as in load it just before the row is presented, this allow for a better user experience as user will not see the loading process aside from the initial one (hopefully they dont scroll like crazy, of course). Granted, sometimes it might be not feasible to use this prefetch due to HTTP API limitations set by backend developer / company. Feel free to use whichever method that you think will best deliver the user experience on tableview!